The Jonsson Library of Government Documents reaffirms Stanford’s traditional strong dedication to high quality reference and information services, providing metadata about the material available in the actual library and covering many topics worldwide from a variety of sources. Most publications are about the United States Congress. Fully accessible through Socrates, the Stanford University’s general online catalogue, the Jonsson database is well-structured and its primary sources include full texts of congressional bills/resolutions both passed and not passed, congressional committee hearings, prints, documents and reports, floor debates, proceedings, journals, directories and biographies, election and voting data, and publications of the congressional support agencies. 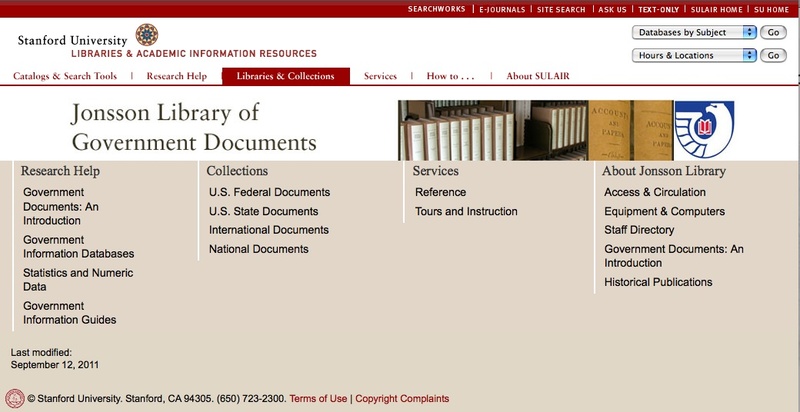 Reference material and other official records are available completely free of charge for any user, thus allowing anybody to easily access, search or browse a top-quality database, including additional reference material and links. Along with a dense (sometimes overloaded) but effective design, this website provides different levels of searchability, and reference data can easily be copied and saved in html format or a printer-friendly version. Full access to the entire collections is possible only for Stanford community members.